There are many causes of tooth staining and discolouration, most commonly consumption of foods such as coffee, soy sauce and red wine or use of tobacco. We have had lots of success performing teeth whitening in Sydney for such cases. In fact, we have successfully performed teeth whitening for our many of our staff and their family members who can vouch for our reliability! Teeth whitening is a conservative and generally reliable way to improve the colour of your teeth by multiple shades. We use 2 chairside (in the clinic) techniques for your aesthetic needs: Zoom™ whitening and laser whitening. For all our teeth whitening patients we also offer take-home equipment and succinct, easy-to-understand instructions so you can safely maintain and/or improve our fantastic chairside results. We also perform internal (inside a tooth) bleaching for teeth that have been darkened after root canal therapy. Some teeth whitening patients often complain of sensitivity to cold temperatures after the treatment. While this is an uncommon occurrence, we have the tools and medicaments at hand to help prevent such sensitivity or minimise it during onset. In addition, all effective home whitening agents used can cause harm if handled by uninstructed hands. At Marsfield Dental Care, your safety and well-being are our top concerns so we’ll make sure that you achieve and maintain realistic results without causing any damage to yourself. Not only will we educate you on how to handle the chemicals safely, but we’ll construct extremely accurate moulds which will conform specifically to your teeth’s shapes. Our chairside whitening sessions can instantly and visibly improve your smile in a one hour appointment. 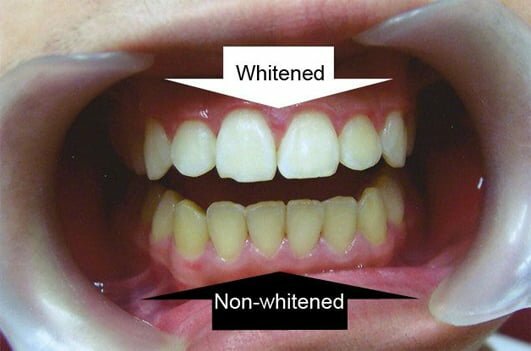 Essentially most professional bleaching techniques involve gently coating the surfaces of your teeth with an agent. These chemicals are then activated (catalysed) by a specific source (e.g. UV light, LED or laser) and are allowed to travel into the hard layers of your teeth without damaging the natural structure. There, they can brighten your teeth by removing the molecules that stain! When it comes to successful tooth whitening in Sydney, look no further than Marsfield Dental Care! We’ll give you a fair and truthful treatment proposal that is specifically tailored to your needs.